IN 1953, the Catholic Missionaries of Our Lady of LaSalette established a shrine and spiritual retreat on a 199-acre lot in Attleboro, Mass. The shrine's motto — "Come nearer, my children" — is reflected in the array of opportunities it offers worshipers and pilgrims to draw close to God. Among them: daily Masses, religious conferences, a soup kitchen for the hungry, and a Festival of Lights at Christmastime that attracts 400,000 visitors. 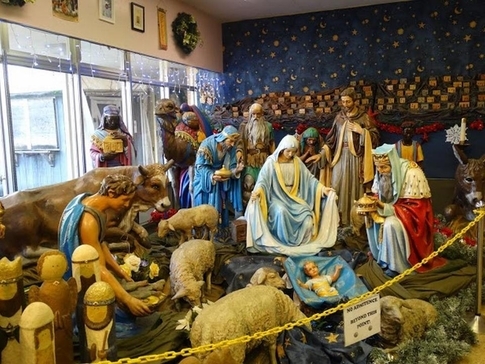 A lifesize crèche on display at the National Shrine of Our Lady of La Salette in Attleboro, Mass. As a place of worship, charity, and religious guidance, the LaSalette Shrine had always been exempt from property taxes — the standard practice everywhere in the United States. But in 2012, Attleboro's tax assessors broke with past practice, and declared that much of the LaSalette property was taxable: the Welcome Center, the cafeteria, the gift shop and conference rooms, and 110 acres of wooded conservation land. The missionaries paid more than $92,000 in real estate taxes, then applied for an abatement, which the city denied in 2013. The missionaries appealed to the state's Appellate Tax Board, without success. On Tuesday morning, their case will be taken up by the Supreme Judicial Court in Boston. More is at stake in this dispute than a local Catholic shrine or Attleboro's budget. The much deeper issue is this: Do religious organizations decide for themselves what they require for their devotional and educational missions, or do municipal tax authorities decide for them? Under Massachusetts law, religious institutions may not be taxed on property used for "religious worship or instruction." Attleboro's assessors argue that only "structures traditionally associated with religious organizations" — such as LaSalette's chapels and monastery, but not its gift shop or nature preserve — should be spared from taxes. The missionaries argue that such a definition not only flies in the face of American tradition, but woefully misunderstands the way their shrine functions. In America, places of religion have always been tax-exempt. "Few concepts are more deeply embedded in the fabric of our national life, beginning with pre-Revolutionary colonial times," the US Supreme Court ruled in a landmark 1970 case, than the "benevolent neutrality" that shelters churches from "the dangers inherent in the imposition of property taxes." There could scarcely be a clearer illustration of those dangers than the Attleboro's assessors' claim that LaSalette's chapel is used for worship, but LaSalette's outdoor grounds are not. The missionaries maintain that the entire shrine is a "house of religious worship" within the context of state law. The exhortation they live by — "Come nearer, my children" — applies everywhere on their property, not just in the chapel. In their written argument to the state's highest court, they offer numerous examples: The Eucharistic healing service and Mass held in the Welcome Center. The ecumenical prayers conducted in the cafeteria. The Blessing of the Animals in the shrine's garden. "During large pilgrimages, the annual Festival of Lights, and other events," they write, "religious worship and celebration occur throughout the entire shrine." Religious groups statewide are watching this case. Many have joined in a friend-of-the-court brief emphasizing the inseparability of worship from works. 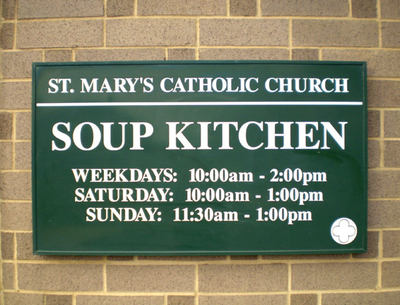 The broad range of charitable and communal activities that take place on church property are often integral to the churches' religious identity and obligations. "It is troubling to think that a local tax assessor would be empowered to decide what constitutes worship for any religious group," argues the brief, which brings together Christian, Jewish, and Muslim voices. It isn't only in pews and with prayerbooks that houses of God fulfill their role. Charity drives and interfaith dialogue, youth retreats and blood drives, marital counseling and religious bookstores — far from being peripheral to a church's religious purpose, they often go to its essence. In the words of one Unitarian Universalist congregation: "The church has left the building." That is what churches are supposed to do, and why Attleboro's tax-grab must be rolled back.